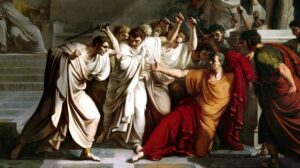 Senate in honor of Julius Caesar, and since last week we had a conversation with Adrian Goldsworthy on Julius Caesar as both a historian and a historical source, it seems fitting enough to pull out of the archives an interview with Barry Strauss about his novel The Death of Caesar. “The past is a foreign country; they do things differently there.” So said L.P. Hartley, a novelist now only remembered for a line that’s now a cliché. Often it’s taken by its speaker as an aphorism meaning that the past is unknowable, unattainable, unreachable. Yet maybe they’re not thinking hard enough about what they’re saying. After all, people travel to foreign countries all the time. When they do, they have essentially two options. One is to see the sites, but to do so from within their own comfortable cultural bubble of people from their own culture, in a modern international hotel, perhaps seeing out familiar fast-food as a comfort. Alternatively, they could learn the language; study some maps; learn a little bit about the culture; maybe even have a guide help them take a look around. The two experiences of that foreign country will be remarkably different.